I sympathize with folks who shy away from using images. On the one hand it is vitally important to use photos in posts. I can tell you from experience, it makes a huge difference in terms of discoverability. But it is time consuming. I know I'm preaching to the choir here, but it must be said: it's crucial that for any picture used, one needs to be crystal clear about how it is licenced. It can be tempting to use one of the many gorgeous pictures that comes up in Google Images. But don't do it, it's a trap! So, where can one get appropriately licenced images? The first images I used were from the Creative Commons over at Flickr. Flickr has developed a friendly, vibrant, community of photographers and I had a lot of fun getting to know some of the artists whose work I used on a regular basis. Images with a Creative Commons licence require that you credit the creator. To which I say, "Of course!" That's a no-brainer and I was thrilled to do it. That's how I got to know many of the photographers over at flickr, they tracked me down and left wonderful comments on my blog. On the other hand, putting in the attribution, getting it right, embedding all the links, takes time. If you're anything like me, there just aren't enough hours in the day to do everything that needs to get done. And, hey, sleeping would be nice! So, lately, I've been using public domain photos for my blog. But this raised another problem: it was difficult to find decent, high resolution, photographs. Then I stumbled across a Wikipedia article (Public domain image resources) that listed dozens of sites offering public domain photos. I say "should," but of course it's up to you. I've found, though, that tagging images with metadata helps readers discover my blog. For example, the other day I googled "short story structure" and was knock-me-down-with-a-feather surprised when one of the images from my blog came up! When I clicked "visit page" it took me right to my blog article! Now, I'm not sure anyone ever actually came to my blog that way, but every little bit helps. What I do is try to remember to take time to fill in the "title" field and the "alt" field with information that accurately describes the article I'm placing the picture in. 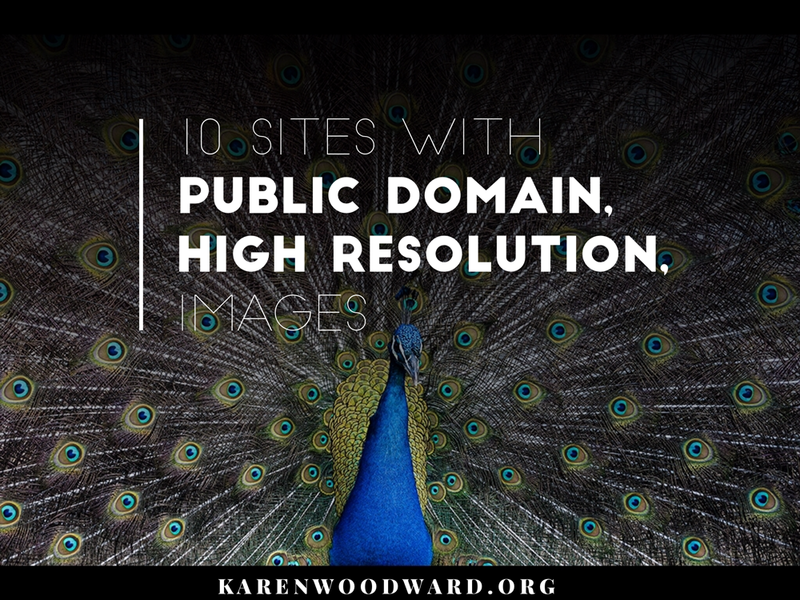 It is undeniably important to have photos on one's blog, not just because it helps your blog become discovered, but because it makes blog posts look more polished. That said, it can be an enormous drain on one's time. First one has to find appropriately licenced photos, then one needs to embed them in one's blog article (I usually have to resize them first), then tag them with appropriate metadata. That can take a lot of time, it used to take me an extra 20 or 30 minutes per post. An app that has saved me massive amounts of time is Word Swag. Yes, that's an affiliate link, but the ONLY reason I'm recommending that app as opposed to another is because I use it daily and love it. It is a very simple app, there aren't a lot of bells and whistles. But, for me, that's part of its appeal. I pick a photo, slap on some text, choose a layout for the text, tweak the colors and that's it! It saves me a ton of time because—frustratingly!—Word Swag can make images look far better than I can and in a fraction of the time. I've used Canva and love it but, for me, Word Swag is easier. There is no learning curve and it just does what I want it to do. That said, if another solution is working for you, stay with it! Don't waste your valuable time exploring solutions to a problem you don't have. If you don't already use photos for your blog, try it out. See how it feels, see whether it makes a difference in your traffic. See whether you look at your blog, at your blog posts, differently. (Personally I think a blog post with a nice high resolution photograph just looks great!) But, in the final analysis, it's all about what works for you. Try things out, experiment, find out what you like; then you can make a reasonable, informed, decision. That's it! I'd love to hear whether you use images on your blog and whether you've found they make a difference in terms of traffic or reader engagement. Over the weekend I'll post a writing prompt, so head over there or follow me on Twitter if you want a quick writing workout. Have an awesome weekend and I'll talk to you again on Monday. In the meantime, good writing! In 6+ years I've written over 1,300 articles about writing, all completely free! Each post takes between one and four hours to research, write and publish. I love blogging and I appreciate my readers, I don't want anyone to feel pressed to support KarenWoodward.org. But if you would like to contribute a dollar a month (that's less than 4 cents per day) I would be thrilled and it would make a very real difference to the site. If you'd like to contribute, or just take a look around, here's a link to my Patreon page.